This world has many amazing motivational speakers, like Tony Robbins, Les Brown, Steven Hawkins and hitting the big stage is the next amazing speaker Thomas Moon. Thomas is a self-advocate and author/motivational speaker (Check out the book and motivational cd at http://blog.squeakywheelchair.com/?page_id=516) Thomas Moon is available to speak at your next conference, event, business event, nonprofit, church, etc. “I am an upbeat guy and a very likable person. I am a product of the foster care system. I was adopted at the age of 11. Before that, I grew up in foster care in Pennsylvania and Florida. I have cerebral palsy, which weakens muscle coordination. I use a wheelchair most of the time, but can walk with supports. Growing up in foster care is difficult. Being disabled, being different and growing up in foster care is very difficult. Again Thomas Moon is available to speak at your next conference, event, business event, nonprofit, church, etc. 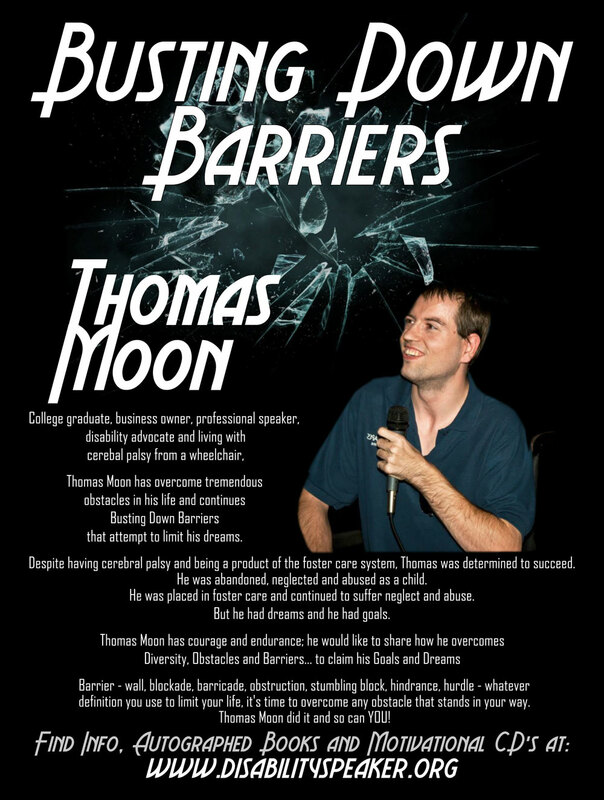 Please contact tj@moonscapes.org, www.disabilityspeaker.org or by phone at 352-502-5994, if you have any questions or to schedule Thomas to speak. Remember to check out the marketing poster below and to not be afraid to squeak your wheels to get things done. I recently made one of my yearly trips to our Capital in Tallahassee. Some years I have make more than one trip, but most of the time it is just one trip to advocate for legislation helping those with disabilities. Chatting with Senator Dean (he will soon be terming our and he will be missed) I was reminded that I have been meeting with him since his first year in office – that was 2002. Time flies, so my trips have been going on for over 12 years. I am not sure if I was visiting before he took office. Encounters blur together and memories are not always perfect. Never the less, it has been a lot of years advocating. Over the years my advocacy has been varied, not just limited to those issues that affect the disabled. In fact my first couple of years centered on children’s issues and my trips were made during Children’s Week at the Capital. Restoring budget cuts for those with disabilities is a big issue this year and will continue to be for the future. Reimbursement rates for those who provide services to those with disabilities have been cut over 14% on the average. And these cuts have been in place for over a decade. This year advocacy groups are hoping to get 7% restored. This will still not bring us back to 2003 levels. Employment and transportation are also important issues. There is an Employment First Bill that could give employers incentives to hire persons with disabilities. Transportation funding always falls short of what is needed. There are still over 20,000 Florida citizens with disabilities on a waiting list for services. The legislature and governor are being asked to provide funding to remove as many as possible from this waiting list and to provide these essential services for our vulnerable citizens. Children with disabilities are still being housed in nursing homes or facilities for adults. Children with some medical needs, usually complex, are being housed in nursing home facilities for the elderly despite a lawsuit and direction from the Federal Government to place them in appropriate facilities. There are many other issues that impact the daily life and quality of life of our citizens with disabilities. These needs should be addressed and solutions put in place. I am a realist when it comes to Tallahassee. I look for, hope for and work for incremental changes. This has worked in the past, as we have moved forward to better serve this population. I am heartened by the fact that we have not taken any steps backward in the last few years. This is an area where two steps forward and one step backward is unacceptable. Are you in a True Competition by Getting an Award by Participating? Everyone will get a trophy. When you think of Special Olympics and even competitions in schools, you think that it is a great thing and will be something the participants will grow from. That is false because how we give out trophies and treat each competitor. Today, Special Olympics and other competitions give each competitor a trophy or ribbon and treat them like they all won. There are different reasons that this does not work and is bad for each of the participant’s future. A rivalry between two or more persons or groups for an object desired in common, usually resulting in a victor and a loser but not necessarily involving the destruction of the latter. The act of competing is to strive to outdo another for acknowledgment, a prize, supremacy, profit, etc. When you give all participants a trophy no matter what, it takes away the point of a competition. Giving every participant a reward no matter how they do, tells the participants that they don’t need to try or work hard at something because they will be rewarded no matter how they do. This is not true because in order to achieve success or get somewhere, you have to do something. Also rewarding everyone no matter what gives the participant no reason to compete and they lose the skills on how to compete. We should start making every competition like a real competition and only give trophies to the first, second and third winners. I understand why a reward might be given to every participant but it’s not about everyone feeling like they won. Failing at things is how we grow and become better human beings. Bill Gates, the president, Joe Smo down the street did not get where they are by getting everything handed to them. They had to work their butts off and still do! To sum this up, let me tell you my story of when I went to Special Olympics. When I was younger I went to compete in Special Olympics once and it was fun but that’s all. After, I told my parents that I didn’t want to be a part of Special Olympics anymore because everyone got a trophy and I wanted more of a competition. Special Olympics is a wonderful thing, don’t get me wrong but it was not for me. Let’s keep fighting and squeaking our wheels because competition is good and will take us far! There was once this lady who was just like you and I. The only thing different was her bones and muscles did not work the same. Does this mean that she should be treated different? The world would say yes. What would you say about this? She is trying to get through life with her disability. She is just an amazing person. She will do anything she can. She will try everything and if she fails she will try something else. Put anything in her way and she will most of the time accomplish it. One day she was walking down the street when someone walked up to her. He started saying mean things about her. He said that she was so crippled that she could not even get out of bed. This hurt her feelings so much she went to her room and started crying. She got down on her knees and asked God to help her not be bothered by the crap she is given. She then went to the Paddock mall. She was walking around and this woman when a big head and a ring in her nose walked up to her. This woman started to tell the lady with the disability that she looked stupid and she should not be in public. The nasty lady got a big surprise when the lady with the disability walked away and said nothing. This lady that took a good jump and said that she was not going to be bothered by what she heard had a great time in her life that said her life would be changed forever. Now everywhere she goes and when people try to bring her down she just walked away. This story is fiction but the moral of it is that because people are different, they are not worth it and treated like no one. (race, color, age and gender) Another point is that no matter family, best friend, etc, if they need to stab you in the back to get what they want, most people won’t think twice. I believe that the end of this world won’t be a ball of fire or even an apocalypse but by the hands around each other’s throats. The only way this will change is that we wake up and start living life like, treating others equal, caring about each other and put a lot of our anger in a hole. We can have a better life but we have to squeak our wheels no matter how annoying it may be! Have you ever been somewhere and there was a UPS truck or something, parked across two or more disabled spots to unload? I was at the movies the other day and this exact thing went down. A truck with a trailer was taking up all but two disabled spots. One spot was taken and the other was open. There were other disabled spots across the way that were open but the point is that those unloading trucks, etc. should be parked in an unloading zone or somewhere else. Definitely not in a disabled spot. When/if you ran into this, would you report it or would you just get frustrated and move on? What I did was get frustrated and moved on. I did not want to start anything, even though I should have. The next time, I will complain to the place I am at and call the police to come fine and fix the situation. Heck, if that does not do anything, I will just block the space hogger in so he can’t leave. This needs to change now! People will do crazy things like this and it is your duty to make sure it does not continue. Did Rosa Parks move to the back of the bus when asked or did she stand her ground and got sick of the way the black community was being treated? Even the public bus (Suntran) in Ocala was about to get it because even though there is a ramp on each bus, it is so steep that a wheelchair can’t make it up. When I ask the bus driver to give me a push up the ramp, they say they are not allowed. They usually help, but the day they absolutely refuse, I will put my wheelchair on the ramp and not move or park in front of the bus so it can’t leave. I can kind of understand their point for not helping but if you know how the bus is, the bus system needs to change how the lift is or something. Time to make changes in this world and don’t stop squeaking your wheels until it is done! If you watch the news you may have noticed the stories about fake service animals. Based on the analysis of the news reports we have an epidemic of fakers taking their pets with them. Yes there are a number of websites that will sell anyone a service dog vest. Yes there are a number of websites that will issue certifications that your dog is a service dot. And yes there are fakers out there. Many fakers are easy to spot. Their dogs are out of control. They bark and lunge at people. They pull products off of the shelves in a store. They are constantly putting their noses and faces up on tables in restaurants. They may even go to the bathroom in a public store or restaurant. The dog is out of control and the handler does not take effective action to control it. So a remedy already exists for fakers whose supposed service dog is not trained or misbehaves. Is it a service dog? What service or task does the dog perform for the handler or owner? However, it is difficult to determine if an animal is fake based on those two questions alone. The business owner can not ask anything else. It is a crime to portray a pet as a service animal both at the federal and at the state level in most states. It is often difficult to prove that an animal is fake or not a true service animal. From a business perspective fake service dogs or any service dog that misbehaves or is out of control can be removed from their business. The law already allows that. The notion that we should change the ADA law or punish valid users of service dogs because of fakers is something that would be very wrong. The ADA was purposely written to allow those who need service dogs the ability to use them without a lot of red tape or hassles. There are groups that want to require certification. However, no two agencies that train or currently claim to certify service dogs use the same criteria. Additionally, there are many owner trained service dogs working that do a great job. Adding certification would add another layer of bureaucracy and also put a financial burden on the disabled, most of who live at or below the poverty line. Persons with disabilities already have a difficult time. They have to deal with SSI or SSDI or both, Medicare or Medicaid, low cost housing, and more. They do not need the extra burden of locating and transporting their service dog to an approved certification agency and paying a fee for certification. Especially since many with disabilities do not have transportation. Yes there are fake service dogs. The handlers should be punished when identified. But to put more paperwork, cost and burden on a person with a disability because of the fakers, just does not make sense. At least that is what I feel as I squeak my wheels.